9x hearing enhancement. 50 db of power. Four wind resistant, high frequency, stereo microphones for precise sound directionality. Sound Activated Compression-SAC, reduces loud louds, like muzzleblasts, to safe levels. 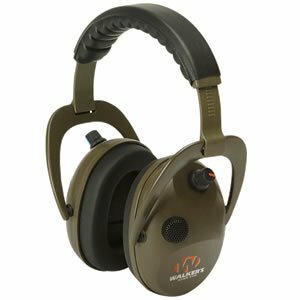 Noise Reduction Rating-NRR, 24 dB. Anti-bacterial agent. Ultimate acoustic seal ear pads. Rotary volume control wheel located on handset. If you have any questions about this product by GSM Outdoors, contact us by completing and submitting the form below. If you are looking for a specif part number, please include it with your message.